If there will be any single movie that may change the way Europeans look on their fellow citizens on the continent in the South, it could be the upcoming documentary “Made in Africa” by René von der Waar und Geraldine de Bastion. “Made in Africa” has given e a very promising impression: On the first public presentation of a raw cut version on re:publica 14 in Berlin, a mixed audience of bloggers, onliners and IT-experts – all visitors of Europe’s currently most important digital sphere conference – reacted with standing ovations and enthusiastic cheers. Obviously, the movie gave a perspective on things going on in Africa that was greeted as convincingly true and as long overdue change of perception. What is this movie about? On a roundtrip in November 2013 through several countries, Geraldine and René met a “young generation of Africans on the rise, striving for success and independence”. The movie simply tells the story of “innovation and technological revolution” and its impact on African societies. If there is one single sentence, that says it all, it may be that mural in one of those ihubs, saying: “We’re not afraid of the future – BECAUSE WE MAKE IT”. Currently, the feature-length documentary “about African start-ups, entrepreneurs and makers” is in its final phase of production. It is going to be aired on major European TV programms. 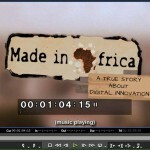 By the way: “Made in Africa” features some contacts that our friends at AfricaHackTrip made. A separate documentary on that border-breaking journey (“5 weeks / 4 countries / 9 hackers”) to “kick-off a continous exchange between the continents” is currently seeking support on indigogo: AfricaHackTrip – The Movie. Have a look at the trailer of “Made in Africa” and listen to Geraldine explaining the concept of that documentary on TedX Hamburg! Made In Africa – The Movie: Trailer One from René von der Waar on Vimeo.